As IAVA launches its campaign to #DefendtheGIBill from cuts in Congress, David Chasteen, IAVA Western Regional Director, penned the following Op-Ed in the San Diego Union-Tribune to highlight the importance of protecting benefits promised to our veterans. In the wake of the Sept. 11, 2001, attacks, America saw a national unity unprecedented since World War II. While military service at the height of World War II was near ubiquitous, the wars of the last decade were fought by volunteers whose civic engagement and political unity was, in large part, motivated by the spirit of service that followed the events of 9/11. 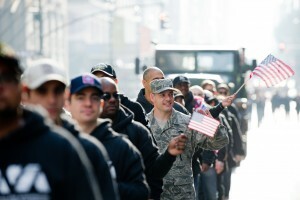 Republicans and Democrats came together again in 2008 to connect the legacy of World War II with a new generation of veterans, by passing the Post-9/11 GI Bill. But America has a short memory. Now, less than a decade after its passage, as the Senate returns to session, the GI Bill is under threat. Following the quiet inclusion of cuts to the Post-9/11 GI Bill in an omnibus veterans bill by the House in February (H.R. 3016), a similar bill is making its way to the Senate floor under the guise of supporting veterans at large. The proposed cuts include a 50 percent cut in the monthly housing allowance provided to children who will have the Post-9/11 GI Bill benefit transferred to them by a veteran parent. In areas with high veteran populations, such as San Diego, this would equal a monthly reduction of $1,154. When Congress passed the original GI Bill after World War II, it supported nearly 80 percent of the male population who came of age during that era. And though it was a costly investment for the country, studies show the bill paid for itself as one of the primary drivers of middle-class prosperity for the Greatest Generation. When the Cold War ended, the shared sacrifice of World War II America gave way to an efficient yet shrinking all voluntary military and an increasingly insular warrior class. But in the years that followed the 9/11 attacks, civilian America unified to let us know that, whether they agreed with the wars or not, veterans had their support. Our servicemen and women were buoyed by an old-fashioned surge of patriotism that lasted more than a decade. Riding the wave of goodwill toward veterans, the post 9/11 veterans organization Iraq and Afghanistan Veterans of America (IAVA), in partnership with the VFW and veteran services organizations from previous generations, brought Republicans and Democrats together to pass the Post-9/11 GI Bill. Despite soaring college costs, the bill restored funding to adjusted post World War II levels, allowing “GIs” of all backgrounds to once again enjoy the advantage of a debt-free education. President Bush asked that the funds be made transferable to dependents if unused by the veteran who earned them and, with this beneficial change made, signed the bill into law. The Post-9/11 GI Bill has sent more than 1 million veterans to school. It has helped veterans in their transition home and has also trained America’s next greatest generation to lead in tech startups, Fortune 500 corporations, nonprofits and at every level of government across the country. The passage of the new GI Bill was a special act of generosity by the American people. It turned potentially cheap talk into a tangible lasting benefit for the young Americans who volunteered to surrender their agency, limbs and lives in the spirit of service. And for many of us, the difficult decision to enlist or re-enlist was heavily influenced by this generous promise of an American dream realized. Unfortunately, that promise is now under attack as Congress looks to use the Post-9/11 GI Bill as its own piggy bank. While arguably the most successful government initiative in history, Congress is looking to use the cuts to the GI Bill to pay for other programs in the veterans omnibus bill. Veterans come from a culture where honor means doing what you say you’re going to do, no matter how inconvenient. Our leaders can only earn trust by honoring their promises. “Never forgetting” 9/11 requires honoring the promises made to those who served in the aftermath. That’s something everyone in Congress should be able to get behind. But you might have to remind them. There’s still time to honor the promise before the cut passes the Senate. You can go to http://iava.org/campaigns/ to learn more about this issue and #DefendTheGIBill.